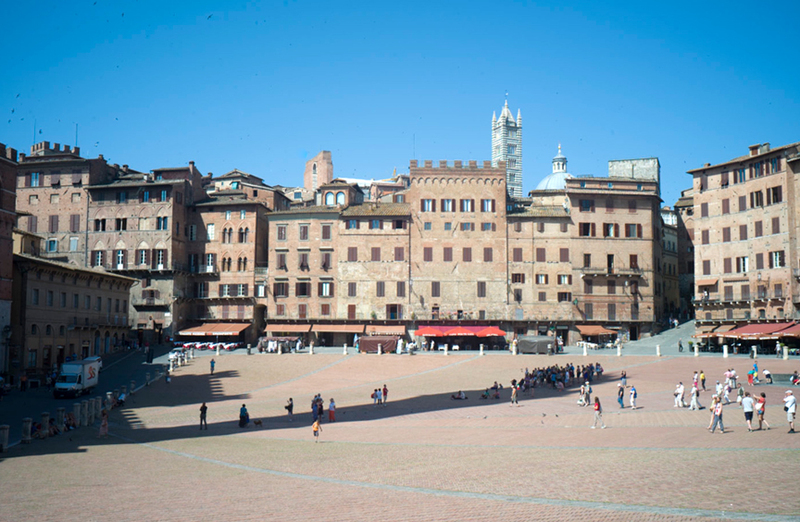 A Brick Beach is what Siena’s main piazza reminds me of. Thousands of people can fit into this fan shaped, south sloping, herring bone patterned arena, and they do, every day during the tourist season. It is here that one can walk among them and feel free to photograph everyone. It has that special vibe where no one feels taken advantage of by a photographer’s curiosity. I used to bring my street photography classes here back when I had a photography workshop from 1995 to 2001. This was always a great place to look at life in all its surprising and playful combinations. 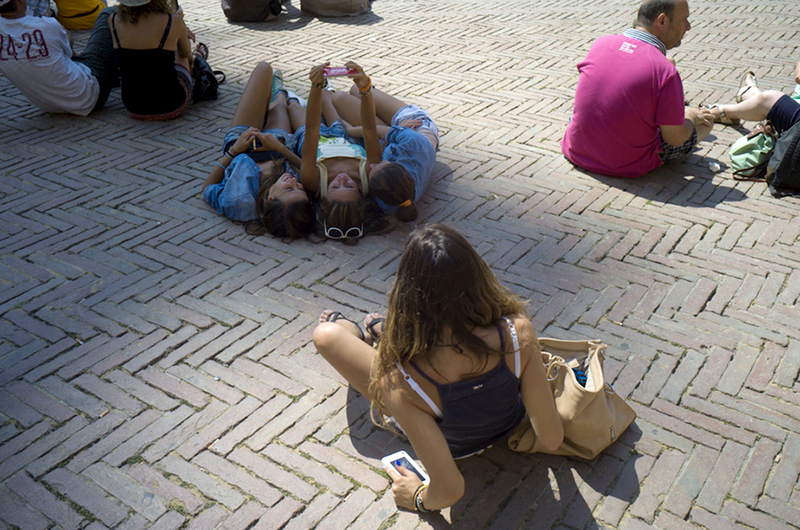 This entry was posted in Beach, Girls, Street photography and tagged Piazza, Siena, Tuscany on August 24, 2015 by joelmeyerowitz2014. Siena’s Campo is one of the most spacious piazzas in Italy, and one of the most unique. It is a fan-shaped, brick patterned, space with 9 divisions representing the different contradas, or quarters, that existed when it was built. It functions as a giant sun bowl filled with people usually lying on the bricks and chatting, sleeping, eating, or playing. But what has always fascinated me – and I would like to make a time lapse video of this – is when groups agree to meet in the Campo they usually avoid the heat of the sun by standing in the shadow of the clock tower, and as the shadow moves, like a sweeping sundial’s pointer, everyone moves with it. I can imagine a very funny short film showing the changing texture of the crowds and varying amounts of people filling the full length of the shadow. This early June morning shows only the first sets of tourists. This entry was posted in Campo, Siena and tagged Piazza, Shadow, Siena, stones, Tuscany on June 18, 2015 by joelmeyerowitz2014.